As the saying goes, what a difference a year makes. Last year at this point, everyone was bashing the New Yankee Stadium, calling it a band box, and how homers were going to fly out of their at a pace the Colorado Rockies would find scary. This year, not so much. Not that the Yankees aren’t hitting home runs—they are second in the AL with 16, only trailing the Toronto Blue Jays (really? ), and 8 of their 16 are at home, in the new Stadium. No the difference are the opponents. In 6 games at the new Stadium this year, Yankee opponents have only hit 4 home runs, and only 8 overall this season, Last year, by April 20th, the Yankees had only played 3 games at the new Stadium, but opponents had hit 9 HRs in the new Stadium—and 17 overall off Yankee pitching. So far, in 6 games, there have been 2 homerless games; last year, it wasn’t until June 18th that there was a homerless game at the new Stadium. What’s changed? Has the Stadium expanded? Have the Steinbrenners installed giant fans on top of the Stadium to blow the balls back in? Well, no. The huge difference between April last year and this April is the pitching. It’s night and day. Early in the season last year, the Yankees had serious problems getting their pitching in order. Chien Ming Wang was imploding, Joba Chamberlain was shaky to say the least; the bullpen—with Jose Veras, Edwar Ramierez and Jonathan Albaladejo in it—was a shambles. The pitching was, plainly put, awful. And that reflects in the Yankees pitching splits from last year. In March & April, the team ERA was a vomitous 5.79; in May it was 4.28, and in June it was 3.79. In short, it took a while for Joe Girardi and the staff as a whole to know what they had, to define their roles and to get their legs under them for the season. That’s what really happened: the Yankees began to find their staff; Phil Coke and David Robertson took over important roles in their pen, Phil Hughes began his tutorial in the bullpen, CC Sabathia began to settle in, and the Yankees found they had a hidden gem in Alfredo Aceves. And that’s carried over to this season. While it is still early in 2010, the Yankees bullpen is stronger and more defined in “who has what job.” The starters—outside Javier Vasquez, whom everybody assumes will straighten out—have been phenomenal, and the bullpen remains strong. The Yankees have a below league ERA and have given up the fewest hits in the AL. As previously stated, Yankee pitching has only given up 8 HRs, 2nd lowest in the AL. But what about the Stadium—that had to play a part, yes? 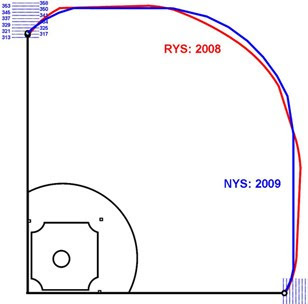 Well, there have been claims that the early spring winds changed after the first six weeks of last year, that the wind shifted from heading out to right, to heading in towards the plate. Maybe, but it wouldn’t explain why this year, the early spring winds haven’t carried out a ton of home runs. It’s a long season, and the Stadium wind ghosts could come back, but what’s more likely the difference between this year and last, is that the Yankees know what they have in their pitching staff, and what they have is very, very good.